Cambridge MA – Feb 25, 2015 – Sustainable Minds®, a B2B cloud provider of environmental product transparency applications, services & data, introduces the 2015 SM Transparency Report™ Framework and Program bringing major advancements to the entire process of creating and delivering product transparency reports. Sustainable Minds (SM) will introduce the 2015 Program to manufacturers and industry stakeholders on Tuesday, March 3, 2015, 2:00pm EST. 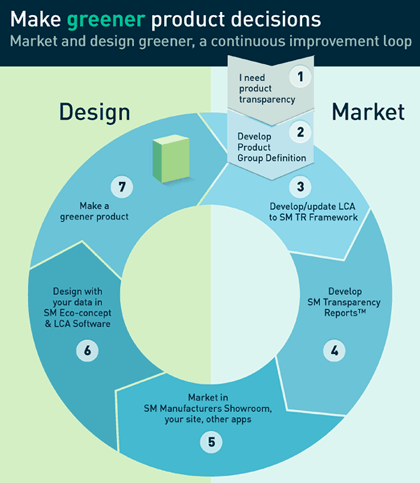 A complete solution for manufacturers to Design and Market greener products. CAMBRIDGE, MA – June 12, 2014 – Sustainable Minds launches the SM Transparency Report™ Program, the alternative to the product category rule/environmental product declaration (PCR/EPD) process with equivalent credibility and verification – plus much more. Sustainable Minds will introduce the program to manufacturers and industry advocates on Tuesday, June 17, 2014, 2:00pm EST. Re-engineers the PCR process providing a more efficient and cost-effective way to standardize reporting and create product group definitions. Drives greener purchase decisions by making life cycle assessment (LCA) and environmental performance information understandable and meaningful; enables a manufacturer to describe how they are making products greener. A third-party certified SM Transparency Report exceeds the ISO 14025 requirements for type III environmental declarations. More than just a report, deliverables include the manufacturer’s product data in a private dataset in Sustainable Minds’ flagship Eco-concept & LCA Software, used in over 750 locations in industry and education world-wide. MORROW, Ga., Nov. 20, 2013 /PRNewswire/ -- TOTO announced today that it is introducing an innovative, new way to report product transparency that enables customers to earn LEED v4 credit for select high-efficiency toilets. Committed to environmental leadership that exceeds compliance, TOTO discovered that it was unable to comply with LEED v4's disclosure option to provide Environmental Product Declarations (EPDs) for its high-efficiency toilets. The company could not do this because there is no Product Category Rule for toilets (PCRs define the requirements of EPDs for each product category). EPDs are required for its building industry customers to earn the highest number of LEED points for purchasing TOTO products. To solve this problem, TOTO, already using Sustainable Minds' LCA software to help it design sustainable products, turned to the company to help it solve this problem marketing. The first company to publish its product lifecycle information with SM Transparency Reports is leading plumbing manufacturer TOTO USA. The need for a new solution became evident when TOTO was not able to comply with the new LEED v4 disclosure option to provide EPDs, for customers to earn the maximum available product credits for purchasing selected TOTO products. The company discovered there is no Product Category Rule (which defines the requirements for EPDs of a certain product category) for toilets, just as there are no PCRs for hundreds of other types of products used in building and construction.